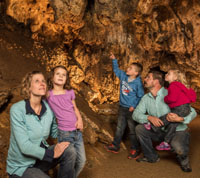 What To Do > Colorado > Vail Valley > Family Fun & Kids Activities > Glenwood Caverns Adventure Park - One of the Country's "Top 10 Family Cave Tours!" Voted one of USA Today's "Top 10 Family Cave Tours," Glenwood Caverns and Historic Fairy Caves are open year-round! Glenwood Caverns Adventure Park is western Colorado's #1 must-see atttraction! A million years in the making...Glenwood Caverns & Historic Fairy Caves is located on top of Iron Mountain in Glenwood Springs. The caves are a constant 52 degrees, making this a "cool" family activity for a summer day or when the winter weather is nasty outside! Two kid-friendly, 40-minute walking cave tours available: Historic Fairy Caves Tour and King's Row Tour. Both travel deep into the mountain to some of the biggest and most decorated cave rooms in Colorado. No reservations needed. Both cave tours and unlimited turns on most other rides and attractions are included in the Funday Pass. Buy online and save. You'll leave smiling!